'Schutzhund' is a German word meaning 'Protection Dog'. It refers to a sport that focuses on developing and evaluating those traits in dogs that make them more useful and happier companions to their owners. Schutzhund work concentrates on three parts. Many familiar with obedience work will recognize the first two parts, tracking and obedience. The Schutzhund standards for the third part, protection work, are similar to those for dogs in police work. While dogs of other breeds are also admitted to Schutzhund trials, this breed evaluation test was developed specifically for the German Shepherd Dog. Schutzhund is intended to demonstrate the dog's intelligence and utility. As a working trial, Schutzhund measures the dog's mental stability, endurance, structural efficiencies, ability to scent, willingness to work, courage and trainability. This working dog sport offers an opportunity for dog owners to train their dog and compete with each other for recognition of both the handler's ability to train and the dog's ability to perform as required. It is a sport enjoyed by persons of varied professions, who join together in a camaraderie born of their common interest in working with their dogs. 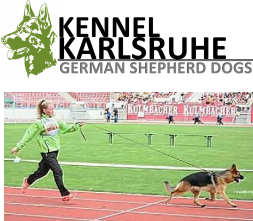 Persons of all ages and conditions of life - even those with significant disabilities - enjoy Schutzhund as a sport. Often, it is a family sport. The tracking phase includes a temperament test by the overseeing judge to assure the dog's mental soundness. When approached closely on a loose leash, the dog should not act shyly or aggressively. The track is laid earlier by a person walking normally on a natural surface such as dirt or grass. The track includes a number of turns and a number of small, man-made objects left by this person on the track itself. At the end of a 30-foot leash, the handler follows the dog, which is expected to scent the track and indicate the location of the objects, usually by lying down with it between its front paws. The tracking phase is intended to test the dog's trainability and ability to scent, as well as its mental and physical endurance. The obedience phase includes a series of heeling exercises, some of which are closely in and around a group of people. During the heeling, there is a gun shot test to assure that the dog does not openly react to such sharp noises. There is also a series of field exercises in which the dog is commanded to sit, lie down, and stand while the handler continues to move. From these various positions, the dog is recalled to the handler. With dumbbells of various weights, the dog is required to retrieve on a flat surface, over a one-meter hurdle, and over a six-foot slanted wall. The dog is also asked to run in a straight direction from its handler on command and lie down on a second command. Finally, each dog is expected to stay in a lying down position away from its handler, despite distractions, at the other end of the obedience field, while another dog completes the above exercises. All of the obedience exercises are tests of the dog's temperament, structural efficiencies, and, very importantly, its willingness to serve man or woman. The protection phase tests the dog's courage, physical strength and agility. The handler's control of the dog is absolutely essential. The exercises include a search of hiding places, finding a hidden person (acting as a human decoy), and guarding that decoy while the handler approaches. The dog is expected to pursue the decoy when an escape is attempted and to hold the grip firmly. The decoy is searched and transported to the judge with the handler and dog walking behind and later at the decoy's right side. When the decoy attempts to attack the handler, the dog is expected to stop the attack with a firm grip and no hesitation.The final test of courage occurs when the decoy is asked to come out of a hiding place by the dog's handler from the opposite end of the trial field. The dog is sent as the decoy runs toward the dog and handler. The decoy runs directly at the dog, threatening the dog with a stick. All bites during the protection phase are expected to be firmly place on the padded sleeve and stopped on command and/or when the decoy discontinues the fight. The protection tests are intended to assure that the dog is neither a coward nor a criminal menace.